Well Spring is here and I have been so slack with my survival skills. Maybe I can make up for it by reading more books. Like another book by Creek Stewart. I saw this in the library so couldn't pass up reading it. Strangely it is the only one of his books in the library. Wonder why they got it in. Anyway, back to the book. 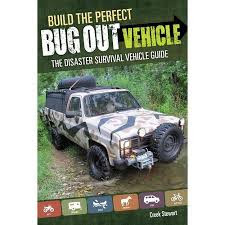 This is the second in Creek's Bug Out series and is packed with lots of information. Like how to made a Faraday cage using a galvanized bucket and cardboard. You need a Faraday cage to protect your electronic equipment in case of an EMP (ElectroMagnetic Pulse). EMPs can be created by solar flares or terrorists. And who wants terrorists wiping vital data from your mobile phone, like the latest Taylor Swift song you downloaded. Other useful ideas are using rat traps for perimeter alarms and how to spray paint your esky in camo colours. Awesome stuff. Most of the book focuses on how to create a BOV. The pros and cons of different vehicles types like SUVs and four wheel drives. All the extras you should pack, like survival gear, winches and chainsaws. While the focus is on cars, towards the back things get creative with boats, pack animals and experimental aircraft. Naturally Creek uses his new BOV to illustrate many of the things you need to consider. And I must say his BOV is a pretty impressive vehicle (that it on the cover). It even has a bike, cart and canoe as backup transport options. What fascinates me is the amazing array of stuff you can legally buy in the United States and I don't just mean the assault rifles. I particularly loved the pepper spray holder that clips into your cigarette outlet. Or the store bought caltrops or the camo netting for hiding the car. It is those little touches that make a great BOV. Sadly we have to just improvise our vehicles here in Australia, Mad Max style.